Hunter Gatherers – Brutish Or Brilliant? HUNTER GATHERERS, BRUTISH OR BRILLIANT? by Ken Fischman, Ph.D. and Lanie Johnson, M.A. Q Russia and the Ukraine have been in the news lately. Can anyone tell me what it’s about? (Discussion). The first shot has been fired in what I call the Resource Wars. Essentially, Russia turned off the spigot on the Natural Gas it pipes into the Ukraine, which is needed to heat homes during the Winter. You see, Russia wants to increase the cost by 400%. Not nice. You may be wondering what this has to do with HGs. A lot. You see, the world is running out of oil and Natural Gas, and this will change our economy and culture drastically. We will be forced to reinvent a sustainable society. Once upon a time, we did have a sustainable society. The present situation requires a little explanation. Back in 1956, an oil Geologist by the name of L. King Hubbert published a paper in which he calculated that oil production in the US would peak in about 1972, and would drop every year thereafter. A lot of smart people derided Hubbert. After all, at the time, the US was the world’s leading producer of oil. Oil is a finite resource. They aren’t making it any more. Hubbert’s students and followers have refined his methods and used them to predict when World Oil production will peak. Most of them say between 2008 and 2012. A few say that we have already passed it. You may have noticed that the wholesale price of oil hit almost $70/barrel a few days ago. Some experts say that it is just a spike due to temporary conditions. Don’t be fooled. These are the same kind of guys who laughed at Hubbert in ‘56. Some facts are simply too ugly to face, especially when your whole lifestyle is at risk. Try to imagine automobile gas at $10-20/gallon. Our whole culture is built on cheap energy. Autos and trucks, home heating, industry, medicine, food. Agriculture runs on oil and NG – fertilizer, pesticides, transport to market, etc. What will happen? Will we go back to the stone age? I doubt it. We will probably go back to the 1890s instead, and those days weren’t so bad. Small towns, local economies, extended families. Are there ways to live a good life without buying lots of “stuff” and flying to Mexico every winter? You bet. Tonight we will look at a culture that did not depend on oil. We can’t go back to the woods again, all 9.2 billion of us, but perhaps we can learn some lessons and extract some principles from these people that will be helpful to us. • “Primitive People were wild animals . . . (they) were not pleasant people. They were fearful and cruel creatures, who beat and killed and robbed whenever they had a chance. They did not have names like you and me. They had names like Umfa Umfa and Itchy Scratchy. Now that we have that straight – – let me tell you about our plan for this presentation. We first got interested in HGs around 20 years ago. In Tom Brown’s week-long wilderness survival classes in the woods, we practiced what he called “the old ways.” – like shelter & friction-fire making (skills we’ll be teaching at the workshop in June). We realized that instead of just practicing skills; we were actually following the lifestyle of ancient people. We began reading about these ancient ancestors. As we took more classes and read more books – we were hooked! Tonight we’re going to follow the ancient tradition of making winter the time for stories & discussion. We’ll share with you what we found out about what HGs were really like. We found neither Rousseau’s Noble Savage nor Hobbes’ Nasty Brute, but real, science-based descriptions. 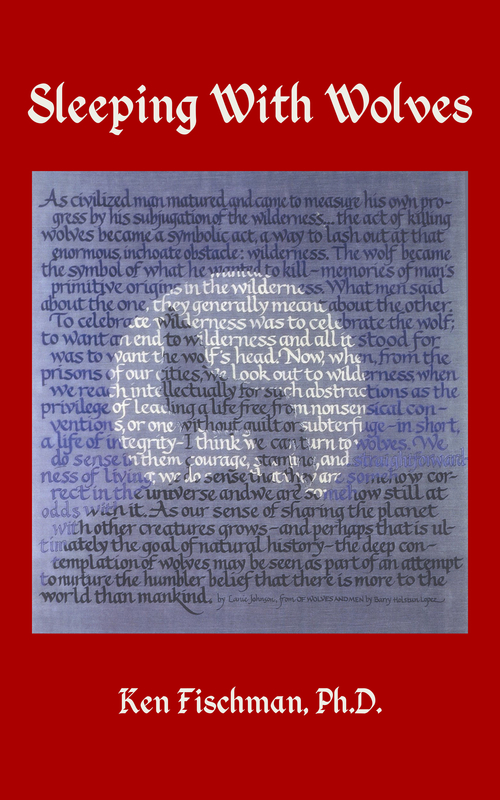 This has been a fascinating and often surprising exploration for us and we think it will be the same for you – – about what we can learn from HGs in addition to wilderness survival skills. You have heard conflicting opinions from eminent writers, historians, and scientists. Tonight, you will get the chance to look at the evidence and decide for yourself. Let me introduce you to the subject of our presentation. Who are these people, and what are they doing? These are the Efe Pygmies of the Zaire Rain Forest. They have just completed a successful hunt, and are dancing for joy. The Pygmies are formidable hunters. They can even bring down Forest Elephants, but most often they hunt with nets. Each family within the group is in charge of making and repairing one segment of the net. They start from scratch, making the cordage from plant fibers. (Those of you who take our Field Class will have the opportunity to make cordage just as these people do). The net is about the height of a volleyball net but much longer – about 50 yards. The men string it up on trees and bushes and connect all the nets to form a horseshoe-shaped trap about a quarter of a mile long. The women, children, and elders drive the animals into the open end of the net by shouting and making noise. You see, hunting is a family and group affair with Pygmies and perfectly fits their socially cooperative lifestyle. You have been hearing their music as recorded by musicologist Louis Sarno. From time to time we will play more of their music. It is in a pentatonic scale. Keep that in mind. It will turn out to be important for you to know. There is some confusion about the difference between Hunter-Gatherers, Indigenous people, Primitive or Tribal people, and so on. People like the Massai and Bantu of Africa, and most east coast American Indians, are not Hunter-Gatherers. They are or were horticulturalists, that is, people who till small gardens, or agriculturalists who farm, or pastoralists who herd animals. The Hunter-Gatherers are none of these. They pursue an ancient lifestyle, which goes back to the very beginnings of Mankind. As their name implies, they hunt animals and gather wild plants they find around them. They live in small groups or bands of 10-30 related persons, who are usually an extended family. They usually marry outside their band to others from related bands, who are in contact with them. They have no hereditary or elected leaders. They make decisions by consensus and have a cooperative, sharing society. Of course, this doesn’t mean they never get angry, jealous, or mean. However, they have created a culture in which such behavior is minimalized. Most of their possessions are communal. They are Renaissance men and women. Everyone in the group above the age of 12-13 has all the skills necessary to live their life style, and if they should get separated from the group they could get on just fine. Contrast this with the average High School graduate in the US. Plunk them down in the middle of the Zaire rain forest or for that matter the middle of New York City and see how long they could survive without all their support systems. Who are these people and do they still exist? Yes, they do, mostly tucked away in inhospitable corners of the world. paragraphs as “prehistory” if they mention them at all. You get the idea that real, important history begins 7 – 10,000 years ago, with the invention of agriculture, the written word and walled cities. In fact, civilization is usually defined in this way, including monumental architecture, hierarchical social orders, & wars. Keep in mind, however, that HGs of one kind or another have existed for a lot longer than our culture has. In fact, we have been HGs for 99% of the time that humans have walked the Earth. In the course of this evening, you will discover what sort of beings HGs were & still are, because they are among us even now. Were they brutal, savage scavengers like Umfa Umfa & Itchy Scratchy, or were they something entirely different? I believe that they are worthy of our scrutiny because of our relationship to them. After all, in both a figurative and a real sense, they are our great, great, great grandfathers. Of all the recent discoveries that are changing our minds about ancient man, the Schoningen Spears top my list. Archaeologist Helmut Thieme was digging in a peat bog, near the Harz mountains in southern Germany. He was in a hurry. An open-pit coal mine was set to expand into that area in a matter of weeks and that peat bog would be history. Instead, it became a startling piece of Prehistory. He was working at a 50-foot depth when his assistant called him over. The assistant had found a piece of wood. That was exciting enough. Wood and other organic material are rare finds in archaeological excavations. They usually disappear quickly, victims of microbial and insect activity, leaving only hard evidence like fossilized bones and chipped flints. But, peat bogs are different. They lack oxygen, and this condition preserves organic material. Thieme and his assistant carefully uncovered the wood. It was 6 feet long and narrow. Then they got to the tip. It had been sharpened to a point! What they had was a spear! When they got to the other end, another surprise awaited them. It too narrowed to a point. It was not only a spear, but it was a throwing spear, a javelin. All this in a layer of the bog that was known to be 400,000 years old. It was not Homo sapiens, but Homo erectus, an ancestral species who made this spear. More surprises awaited them when they analyzed their find back at the laboratory. The spear was made from the trunk of a 30-year-old spruce tree with its anterior end toward the base of the trunk. That meant that it contained heartwood, the hardest part of the tree, where the tree rings are closest together. Furthermore, it was carved in such a way that half of its weight was in the forward third of the spear, which gave it perfect aerodynamics. That is the way an Olympic javelin is designed. . This was no accidentally sharpened piece of wood. Back at the peat bog, they found 6 other such Javelins. Thieme’s report sent a shock wave through the Paleontological world. This fellow Homo erectus, was a lot smarter than they had thought. The spears’ manufacture took planning and forethought. Its existence also meant that Homo erectus was no Hyena-like scavenger, but a hunter. And, hunting implied cooperation and cleverness, perhaps even language needed to coordinate the strategy of the hunters. After all they were after large mobile game such as horses, and as thousands of butchered bones at the site testify, they were often successful. And the use of a javelin meant that the hunters did not have to get up close and personal with a quick and potentially dangerous prey animal. They could kill or wound it from afar. Next best thing to a 30-30 with telescopic sight. Of course there were a few nay-sayers. It wouldn’t be science if there weren’t. One of them doubted that it was a javelin. He said that he had looked through many weighty anthropological texts and found that only 1/96 contemporary HG cultures used spears for throwing and not for thrusting. It sounded impressive. Anthropologists love controversy. They can then speculate endlessly. Well, as the Irishman asked when he entered a bar in which a brawl was going on, “ Is this a private fight, or can anyone join in”? I joined in by asking what’s the point of having a thrusting spear sharpened at both ends? (Please excuse the pun). Furthermore, how would that critic explain this [show Bushman throwing spear image – C203] I rest my case. Most archaeological digs of ancient man are bleak places. A few trenches and some wooden stakes connected by strings, are all you can see. They give you no idea about how our ancestors lived. Bilzingsleben in the former East Germany is different. It is a site on a wind-swept moor, along a small stream that leads into a nearby lake. It looks like a scene out of Wuthering Heights. It clearly was a hunting camp. Scientists have uncovered 3 small round or oval dwellings, whose foundations were made of rocks and animal bones. This immediately brought to my mind arctic river trips I have read about in which the authors found rings of rocks and bones where the Inuit Eskimos had their dwellings. Those of you who attended our first workshop may remember one of the main rules of survival – use what is handy. The next part described brought back other memories. It was a pit, on the periphery of the camp, and far away from the other structures. It was filled with flint fragments and had anvil stones around it. I flashed back to the Rabbitstick primitive skills rendezvous that Lanie & I like to attend. There is an area set aside, far from the other busy camp activities. It consists of a pit with a few logs around it where the flint-nappers work. Flint, chert, and obsidian have the sharpest edges in the world, and they would not want the many children that frequent the camp, or anyone else for that matter, to blunder in there with bare feet. The inhabitants of the Bilzingsleben camp had obviously taken similar precautions. There was another area away from the dwellings that was a refuse site. I guess they didn’t like the idea of someone walking through the camp and carelessly throwing away banana peels or whatever. Again, we had a similar place at Rabbitsick, but I doubt that the Bilzinglebeners had garbage cans. There were also signs of hearths. Archaeologists also found 4 intentionally-marked elephant bones. The bones had many parallel lines, all engraved by the same instrument, and one had a zig zag, made without lifting the engraving tool. When archaeologists find such bones they assume that they are counters of some sort – perhaps calendars. Well, of course I have been keeping you in suspense about who did all these things. Now it’s time to “fess” up. The Archaelogists also found molar teeth and skull fragments, which they identified as belonging to our old friend, Homo erectus. The erectus bones were dated at 300-350 thousand years old. A lot of anthropologists had figured that Homo erectus was hardly smarter than a Chimpanzee because he had a similar brain capacity. Now lets see, these Homo erectus built dwellings, kept separate sanitary and tool building sites, perhaps knew fire, and kept records of something. I don’t know if his references were Baboons, but I am impressed. A couple of years ago I heard a young Peace Corps volunteer being interviewed on NPR about her experience in a remote mountain village in S. America. She had gone there to teach the Indigenous people and help them build, modern hygienic facilities such as pit toilets. These images will give you an idea of social interaction among modern Bushmen and Pygmies. • These people are non-hierarchical and cooperative – as when some British people taught Australian ABOs to play soccer. The ABOs caught on quickly and played well, but surprised the Brits when they played until each team had made a goal, and then stopped. They figured that was the object of the game. Society and Economy are a chicken and egg situation, but now that you’ve seen a bit of the society, here is some information on their economy. As Ken described earlier, HGs were small, nomadic bands of extended family members – with no permanent dwelling, no private property, and no storage of food. They carried very little with them. If they needed a tool, it was easy to make quickly because raw materials were free and available to all (and of course they had the skills to make the tools). They had everything they needed because their needs were so simple. As Marshall Sahlins, author of Stone Age Economics, put it: “we are inclined to think of Hunters and Gatherers as poor because they don’t have anything; perhaps better to think of them for that reason as free. “ Free for what? to enjoy life! What about the health of HGs? Let me ask you for a couple of estimates: what would you say is the current world-wide average life expectancy? (67) What is average HG life expectancy? (I found a range of 54.1 – 67.1) One more question: what percentage of deaths in industrialized countries are caused by cancer, heart disease, diabetes, emphysema & cirrhosis of the liver? (more than 75%) These so-called diseases of civilization are close to non-existent in HG cultures. Now, here’s a little food for thought: from a rare study on HG diet and health. Back in the 1920s and 30s, Dr. Weston A. Price, a dentist practicing in Cleveland, was concerned about the cause of increasing dental decay in his young patients. He traveled all over the world and visited primitive people who were totally isolated from modern civilization and lived exclusively on indigenous diets. He concluded that tooth decay and bodily disease were promoted by nutritional deficiencies. He also observed that whenever any members of these groups adopted modern, refined foods, there would be a consistent degeneration of their health followed by that of any babies born after the change in diet. Among the people he visited and examined were Eskimos of Alaska, South Pacific Islanders, Africans and Australian Aborigines. Although their diets varied widely, all of their diets provided fresh, whole natural materials for body building and repair, including minerals and vitamins necessary for mineral absorption. Some North Canadian Indians ate the organs of Caribou and fed the muscle meat to their dogs. Dr. Price analyzed 14 different diets that consistently provided almost complete immunity to dental decay along with high resistance to disease. Here is diversity and similarity again! D401 / These Melanesian Island boys lived on shellfish, regular fish, fruits, greens, roots & coconuts. Although they seem to have a family resemblance, they were born on 4 different tropical islands. They are not brothers but healthy individuals expressing their hereditary racial characteristics. D402 compare their diet with that of the Australian Aborigines who lived in the desert with little rain & infertile soil: wallaby, kangaroo and rodent – muscle & organ meat – plus insects, beetles, grubs, roots, stems, leaves, grass seed & berries. / One of these 4 women followed this diet; the other 3 exhibit the deformities & low immunity that Dr. Price found typical of those whose parents had adopted a modern diet: narrow face due to inadequate bone structure, pinched nostrils, narrow dental arches and therefore, crowded teeth. He found that traditional ABOs (many of whom never brushed their teeth at all) had no cavities, while those on a modern diet had 70.9% cavities. D403 / Although deformities cannot be reversed, Dr. Price does indicate hope for people on our modern diet. Both of these girls are patients of his from an American family. 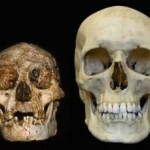 The one on the left shows the narrow face and crowded teeth. Her birth required 53 hours of labor. Her mother subsequently changed her diet to include milk, green vegetables, sea foods, organ meats and high-vitamin butter & CLO. The younger sister on the right needed only 2 hours of labor and you can see the difference in the form of her face and teeth. (a) An intentional burial of a 40 year-old Neanderthal, now nicknamed “Nandy” was found in the Shanidar Cave, in Iraq, and dated from 46 – 60 thousand years ago. “Nandy’s most striking feature was that he had a withered right side, obviously a congenital defect. His collar bone, shoulder bone and arm bone were all underdeveloped. The arm bone had been deliberately amputated in later life, and the stump had had time to heal. In addition he had worn-down teeth, healed head wounds, and was blind in his right eye. He was a mess! 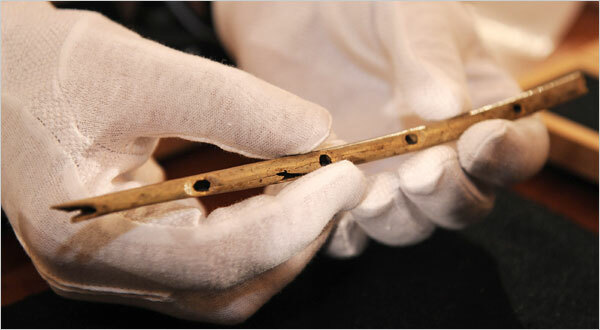 As though “Nandy” was not a startling enough discovery at Shanidar Cave, there was yet another surprise lying there. Another adult male, 50-60 years old, was found buried, and he had at least 7 species of flowers or herbs sprinkled over him. They were not just any old pretty flowers either. Most of them, such as Yarrow and Ephedra, had obvious pharmacological properties, showing a knowledge of “folk” medicine, and perhaps the hope that he would eventually be healed, even after death. My son, the journalist, traveled to the little town of Dmanisi, in the Georgia Republic a few months ago. Besides a nice little vacation, he had another object. He wanted to look at a skull recently dug up there. It wasn’t the first skull found there. There have been 7 others, all of them some form of H. erectus. They are located on a plateau, high above the confluence of two streams, apparently an ideal place to corner food animals. Dmanisi shows all the signs of having been a H. erectus hunting camp for thousands of years. There are lots of animal bones lying around, and many of them show cuts indicating butchery. There are also hand axes all over the place. So, what was so unusual about that skull that brought Josh thousands of mile to view it? Just this, The skull is toothless, and it also shows regrowth of the jaw after the teeth fell out. Same old question. Who took care of this guy? Did someone grind up his food so that he could swallow it? And, most important, how could this have happened if H. erectus was such a thug? Do thugs have compassion? Oh, I forgot to tell you. This skull is 1.8 million years old. One more thing –archaeologists have puzzled over all the rounded river stones found in the camp. They had to be brought up from the streams below with considerable effort. Obviously, the archaeologist’s knowledge of hunting and gathering is purely academic. They must never attended primitive skills rendezvous. If you come to our skills intensive in June, we will show you how to make a quicky discoidal knife from river stones. Story: A few weeks ago, I happened to be in Staples, when a woman came in wheeling a baby carriage. At least I think it was a baby carriage, but it didn’t look like the one I pushed my kids in long ago. In fact, it looked more like an armored tank than a carriage. It was made of some heavy-gauge, gray-colored plastic material, and had about as many wheels as an armoured personnel carrier. However, the thing that startled me was the top. It was also of the same gray plastic material and resembled the top of a tank, complete with turret. It also had what looked like bullet-proof shielding on it that completely closed the inside of the turret to view. And, it was the inside that I wanted to look at because from the stygian depths of that armored vehicle came an incessant, though muffled wailing that never stopped, not even for 2 seconds. The desperation of the occupant was obvious to me, but not apparently to the mother. She appeared absolutely oblivious of the situation inside the perambulator/tank as she wheeled it up and down the aisles, picking up various items of merchandise, which she then piled on its top. How convenient! This went on for a full 10 minutes until she arrived at the cash register, and had completely carried out her apparently complicated financial transaction. It was then, and only then, that she opened the visor of the armored vehicle, reached in, and lifted out a tiny, dark-haired, infant who was obviously only a few weeks old. She placed him/her/it against her shoulder, and the desperate wailing instantly stopped. It was obvious now what that baby had wanted. Let us turn to a more pleasant subject, the parenting behavior of the savage iKung! or San Bushmen of the Kalahari desert. Many anthropologists have studied them. The situation reminds me of a story Joseph Campbell told about the interaction between the Navajo and anthropologists in the 1930s. The typical Navajo family he said, consists of a mother, father, child and 2 anthropologists. The point is, that Bushman parenting has been thoroughly documented. The Bushmen raise their children together, the babies are in constant contact with their mothers and are carried everywhere all the time. San babies are never left alone. Bushman mothers sleep in contact with them, and The babies breast-feed continuously. Mothers respond to crying within 10 seconds, over 90% of the time. Can’t you just see that anthropologist standing there with his stop watch? Bushman children control their own breast-feeding, which continues for the first 3-4 years of the child’s life. By the way, continuous breast-feeding stops ovulation and of course prevents fertilization. This is one of the Bushman’s main ways of population control, which has worked well in a area with limited biological carrying capacity for who knows how many hundreds or thousands of years. Is this behavior an anomaly, or is it similar to that of other Hunter-Gatherers? Let’s look at the Efe Pygmies of the Ituri rainforest. After all, it is very different environment from that of the Bushmen. The Pygmies have a parenting strategy that differs in detail from that of the Bushman, but you will see that the basic principles are the same. Pygmies bond to many babies and child care is a group activity. The babies are passed among group mothers, carried to foraging sites, and their care is shared. Please note: this is also true for males. All mothers respond to fussing, giving the breast even if it is not her baby. This multiple caretaking model fits the way of life of a social, interacting band, in which communal connections are the basis of their economic pattern and the foundation of their social system. (L) We are very fortunate to have as our guest tonight, Dr. Jack Wright, whom some of you may know by his marital name, Oakwright. He has been a psychologist in Sandpoint since 1975 and is President-elect of the Idaho Psychological Association. Cro-Magnon cave paintings in France and Spain, such as the “Sorcier des Trois Freres” may also represent Animal Masters or some kind of sympathetic magic, insuring the success of the The Great Hunt, which was surely early Man’s greatest occupation. His view of the Earth as sacred is demonstrated in contemporary HGs like Australian Aborigines, who see animate forms in natural geography, like the “woman’s legs” in NW Australia. “The moon was full, so the dancing had gone on for longer than usual. Just before going to sleep I was standing before my hut when I heard a curious noise from the children’s nearby bopi (i.e. a play field). This surprised me because at nighttime the pygmies generally never set a foot outside the main camp. I wandered over to see what it was. There, in the tiny clearing, splashed with silver, was the sophisticated Kenge, clad in bark cloth, adorned with leaves, with a flower stuck in his hair. He was all alone, dancing around and singing softly to himself as he gazed up to the treetops. … After watching for a while, I came into the clearing and asked jokingly, why he was dancing alone. He stopped, turned slowly around and looked at me as though I was the biggest fool he had ever seen; and he was plainly surprised at my stupidity. If we sell you our land, remember that the air is precious to us, that the air shares its spirit with all the life it supports. The wind that gave our grandfather his first breath also receives his last sigh. The wind also gives our children the spirit of life. • how many of you, when feeling weighed down by cares, go for a walk in the woods or a park to “de-stress”? • how many like to camp, hike, fish, hunt, travel, wander? • how many enjoy drumming, singing, dancing, storytelling (including ghost stories) around a fire circle? • how many have played games of chance or stalking games like “capture the flag”? • how many eat (or try to eat) a natural, whole-foods diet/organic foods? • how many interested in “Voluntary Simplicity”? • how many were NOT surprised at the results of the cooperativeness experiment with MRI? Those who raised their hands a lot are good H-G material! (K) This is the time when Presenters usually sum up and offer their conclusions. We thought that we would do it differently this time and ask you what your conclusions are. Do you have any conclusions? What have you gotten out of this presentation? (L) We’d like to extend our special thanks to our sponsors, the Bonner County Library and PFOS, especially Paul Fosselman, Joyce Jowdy and Becky Kemery. Also to Dr. Jack Wright, Diana Scott for her Australian slides, (Lynx Vilden for her Kootenai River Project slides) (Kristofer Yamada) (Yontan Gompo) Joshua Walters (and Chris Anderson) for their help. We especially thank the Librarians, Gloria Ray and Sue Elsa, who dug up valuable material we could not find ourselves. Alone I cry. The rain is near. The Earth cries Your hunter is here.